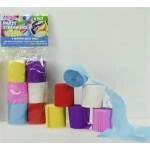 9 rolls - Boat streamers assort colours ..
6rolls - Crepe Streamers. Asst. 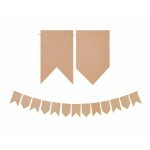 Bright Colours ..
Kraft Paper Bunting, 2 style flags. 13 flags (alternate styles) on a cord. Each cord 4.5mts. 10 lengths per packet .. 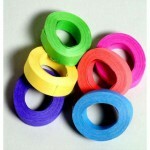 Satin Ribbon Green 3mm x 25mt .. 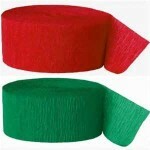 Satin Ribbon Red 3mm x 25mt .. 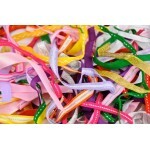 Satin Ribbon White 3mm x 25mt ..
Pk assort colours and lengths 35gm ..
pack 35gms assorted christmas colour theme ribbons including metallics. assorted lengths ..